President Jim Gaertner recently recognized the 2009 Staff Excellence Award recipients. They include (from left) Susan Hayes, Randi Clower and Evelyn Hasouris-Turner. 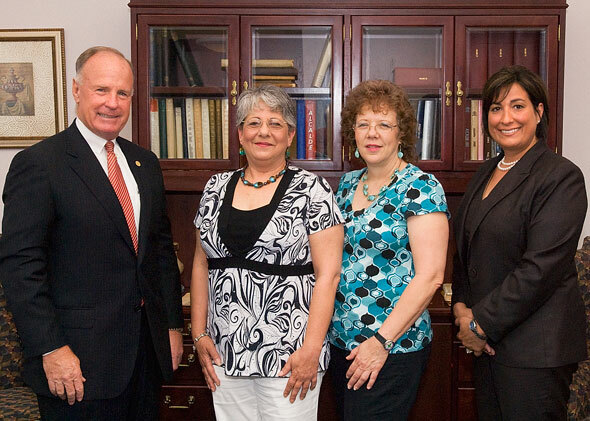 Three Sam Houston State University employees have been selected as recipients of the 2009 Staff Excellence Award. They are Evelyn Hasouris-Turner of the College of Humanities and Social Sciences, Randi Clower of the Department of Language, Literacy and Special Populations, and Susan Hayes of the Department of Curriculum and Instruction. Three awards are given annually to full-time staff members who excel in their job duties through excellence in service, proven commitment, meritorious performance and high level of motivation. Staff members are selected based on nominations by their peers, supervisor and members of the SHSU faculty. In addition to a plaque of recognition, each recipient will be honored during the general university meeting at the beginning of the fall semester and awarded a $2,000 bonus. Hasouris-Turner is an administrative assistant in the office of the dean of the College of Humanities and Social Sciences and has been employed at SHSU for 12 years. Clower is a secretary III in the Department of Language Literacy and Special Populations and has been an SHSU employee for five years. Hayes is a secretary III for the Department of Curriculum and Instruction. She has been employed at Sam Houston State for six years. “Susan has always been available and most willing to explain the countless procedures that a new employee needs to know. She does this in an efficient and reassuring manner. Her willingness to help students and faculty alike is evident in the friendly, professional, and collegial atmosphere of our offices."